Should one grease the tapers of bottom bracket spindles before installing the cranks? Few topics spur as much controversy among bike mechanics as this question. In the old days, Campagnolo not only recommended mounting the cranks dry, they even suggested degreasing the tapers. The concern was that grease might facilitate the crank slide up further and further on the tapers. And since many of us learned about bicycles when Campagnolo was the undisputed king of components, the word from Vicenza was treated as gospel. More recently, I worked for Race Face as a technical writer and translator, and their engineers disagreed. They advised: “Grease the tapers, but make sure you only tighten the bolts once, then leave them alone.” Their tests had shown that a “dry” spindle/crank interface did not result in a consistent press-fit between the parts. As we developed the new René Herse cranks, we discussed this topic without coming to a conclusion. In the mean time, our engineer mounted the first test cranks without grease, and found that they had unacceptable levels of runout of the chainrings – the chainrings didn’t run as true as we would have liked. (“Unacceptable” means that the runout was visible even if it did not affect the function or performance.) When the runout changed each time he mounted the cranks, we realized that the cranks were not seating uniformly on the taper. What exactly was happening? Imagine the crank and spindle surfaces as tectonic plates that slide past each other as the crank bolts are tightened. If you grease the interface, they will slide smoothly until you stop turning the bolt when it is tight. If the interface is “dry,” the crank catches on the spindle. This builds up tension, which then is released in an “earthquake.” Even with the same torque, the crank will sit differently, depending on whether the tension has been released or not, before you stop turning the bolt. With grease, the crank’s position was more uniform, as the crank slid smoothly onto the spindle. What about the crank arms “migrating” further and further onto the spindle each time you mount the cranks? To test this, we mounted a René Herse crank, tightened it to 25 Nm (the recommended value), then took it off, mounted it with 30 Nm … we repeated this 5 times, increasing the torque by 5 Nm each time until we reached 50 Nm. The goal was to find out when the crank would be destroyed. To our surprise, the crank did not move any further onto the spindle. We could not destroy the cranks in this way. A 1990s Campagnolo C-Record crank that we tested for comparison slid further and further onto the crank. We stopped the experiment early to avoid breaking the classic Campagnolo crank. The difference between the two cranks appears to be that the new René Herse cranks have a forged taper. This makes that part of the crank assembly much stronger. The C-Record crank appears to have a machined taper. Every time the crank gets mounted on the spindle, the aluminum moves – in fact, mounting the crank acts in the same way as a forging process. It is likely that this process would stop eventually, but I’d rather not experiment with a classic crank. So for our René Herse cranks, we recommend that you lightly grease the crank spindle. Also grease the treads of the bolts, but not the underside of the bolt head. (The underside of the bolt head should interlock with the crank, so it doesn’t come loose.) Then tighten the bolts to 25 Nm. That is it. If you like, you can check after your first ride that the bolts are tight. Thereafter, leave them alone. Crank bolts can loosen over time, but that does not mean that you should re-tighten them. Instead, remove your cranks every couple of years and inspect them for cracks. (You should do this with all cranks, no matter the brand.) Then put them back on, and enjoy them some more. Treated like this, quality cranks will last most riders for many decades. This entry was posted in Bottom brackets, Cranks, Testing and Tech. Bookmark the permalink. 27 Responses to To grease or not to grease? Grease vs. anti-seize compound — on a bicycle, when/where to use which? I don’t use dedicated anti-seize compounds on my bikes. On sliding surfaces, I use grease (seatposts, stems, headset cups, BB tapers, etc.). On threads, I use beeswax or Loctite. On spokes, I use Wheelsmith’s spoke prep. All prevent seizing. I understand that for some titanium and especially carbon parts, special anti-seize compounds are useful, but I don’t have any of those on most of my bikes. Jan, I’m with you on just using grease for most things, with locktite or beeswax on small bolts. Carbon components have to be lubed with a type of grease that has something like fine sand particles in it. Generally sold as “Carbon Prep,” or some other similar name. If you put regular grease on a carbon seatpost it will forever slip down. Like you, I prefer steel bikes and aluminum components. I like anti-seize for ferrous/aluminum threads particularly on interfaces that may be exposed to salt from sweat, sea water or deicing. The additives seem to slow the corrosion of the aluminum. Grease goes on bearings, anti-seize on threads. It’s sub-optimal, but you can get away with grease on threads. However, never EVER put AS on bearings. With grease, there is no inert metal, only the oil lube. Oil is perfect for bearings, but over time can be expected to migrate out of threads allowing direct metal on metal contact which leads to corrosion. With AS, the oil is only a carrier for the particles of inert metal (aluminum, nickle, copper, etc.). In time, the oil should evaporate leaving a layer of non-corroding metal behind. However, a layer of metal is exactly what will mill the bearings down to nothing. Jan, you are totally correct. A thin application of general-purpose bike grease on the spindle is the way to go. In my business, Island Bicycles, we made this discovery about 20 years ago. Bikes often came in with “creaking” cranks. We’d remove the arms, lightly lube the spindle with grease, reinstall, and voila! Fixed! Also very correct about NOT over-torquing, especially cheap melt-forged cranks. That is a good question! I think you just want to be careful not to overtighten the cranks. I used to ride Campagnolo Croce d’Aune cranks on my racing bike. I overhauled the BB every year, and the cranks were no worse for wear after 40,000+ miles and five years. If you never take the cranks off, you might have the crank bolts fall out eventually… and you should inspect them from time to time for cracks anyhow. Excellent article particularly for us bike shops out here. Can you advise those of us who service lower-end to bottom-of-the-pond/ big-box brand bikes that often use highly questionable alloys or steel arms? We’re located on a college campus, so many of our customers will walk in with their left crank arms in hand asking us to reattach them after they’ve fallen off (one arm, which I’ve kept for our “Wall of Shame”, was stripped to an almost perfect circle!). So, we replace a LOT of left crank arms with replacement quality arms, or, if they’re just loose and the arm tapers aren’t showing damage then we’ll retorque them on to the more-or-less standard 400 in. lbs torque. We’ve begun to wonder if the BB spindles from these factories aren’t way out of proper spec causing some of the problems in addition to the lesser quality alloys used in the crank arms. Anyway, your advice and insights would be much appreciated. I really don’t know much about inexpensive bikes that have been abused. If the crank just barely has loosened, I once was lucky and tightened the crank to 35 Nm, and it stayed on thereafter. To some degree, the taper is regenerative, that is, you can reform it as you push the crank onto the BB spindle. Runout is how much the chainring is out of true. To elaborate on chainring runout, there are two kinds. Axial runout and radial runout. Axial is, roughly speaking, “wobble”. Radial runout is the degree of eccentricity, which would cause the chain tension to vary. Radial runout is important with FG or SS drive trains; consistant chain tension adjustment gets difficult.Too much axial runout and chains could come off. I’ve been greasing the tapers, threads and underside of the bolt heads for about 30 years with never a failure. That’s with Campy, Shimano, Sun Tour and Ritchey cranks (all square taper) and also a Truvativ ISIS crank. My cranks have only once come loose (a Campy crank, interestingly enough). My question is whether the effect you noticed with the Campy crank was from machining the taper into the crank or the alloys used in the respective cranks (or both). So, Jan, it looks like you’ve established a procedure and torque spec. for your Rene Herse cranks that works. However, that’s just one case. This reminds me of the controversy over whether one should use grease, anti-seize, or for attaching car wheels. In that case, the torque used is very important. We cannot make recommendations for other manufacturers products. That said, like many others, I have used the same procedure for many years on Campagnolo, TA, Ritchey and other cranks with good results. Are there any advantages to having a built-in washer on the crank bolt (other than historic accuracy/interest), as opposed to a loose washer? it would seem logical that this would at least make it easier for the washer (steel) to cut into the softer crank (aluminum), if it were so inclined, and that can’t be a good idea. The integrated washers on track bolts are still free to turn . . . I can’t actually imagine where it would ever be a good idea to attach the washer to the bolt, where different hardnesses of material are involved. The washer doesn’t cut into the aluminum. I have worked on many classic René Herse bikes, and none had any problems there, even after 50 years of use. You make a good point that the washer could provide a surface on which the crank bolt can turn, but most washer and bolts had finishes that weren’t very smooth in the first place, so I suspect that in many cases, the washer still turned on the crank. Most semi-modern crank bolts (with Allen heads) had built-in washers. The only disadvantage of a loose washer is that you can forget it when you remove the crank. Then the remover pushes onto the washer, which pushes onto the crank, and you strip the extractor threads of the crank. With the built-in washer, this obviously won’t happen. Interesting…I recently installed a different brand of crank on a square taper BB and have significant ‘runout’ on the rings. I assumed the chainrings were not of high quality, but I’ll do some tinkering and see if it’s the install that is to blame. Perhaps someone can correct me, but I thought the whole purpose of the tapered spindle was to provide a wedge fit, as the angle is a few degrees different between spindle and crank. No, the angle is the same on crank and spindle. It’s a taper fit, where the crank goes onto the spindle until it is tight. I always grease “em. But not like a pig at county fair. A thin film is all thats wanted here. No problems in over thirty years. The problem of cranks creeping up the taper over time probably has more to do with soft metallurgy than with the grease. I’m a full-time working mechanic. I grease crankarm bolt threads–a thin “just enough” film of grease will squeeze through when you tighten them. Anti sieze only for customers who are known sweat monsters. For the amount of rain we get around here I have had good luck with lanolin (Lanolube from Rivendell) to prevent seizing of quill stems, seatposts, bottom bracket shells, and pedal spindles. Any aluminum/steel interface. I also use a thin smear on bottom bracket spindles. No problems so far. 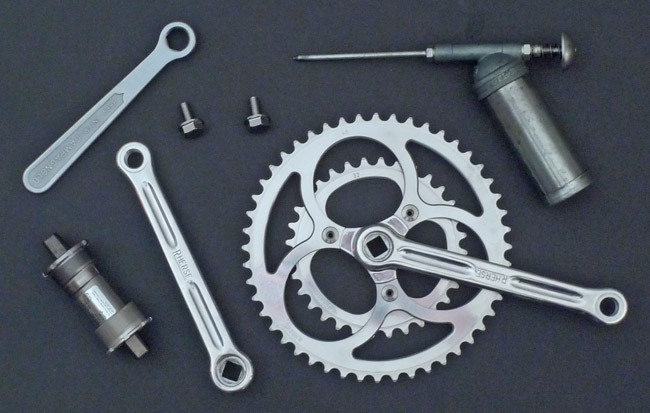 I too have been installing cranksets for well over 35 years and typically mounted Campagnolo crank arms without greasing the bb spindle – always without issue. With that said, when mounting the right crankarm, I would always try different ‘faces’ on the spindle (with a palm tap-on) to find the interface with the least Axial wobble and then proceed to place and tighten the fixing bolt and washer. With tightening, if anything, the arm and chainring got straighter. How does this reconcile with your explanation of the “earthquake” happening with a dry bb spindle?